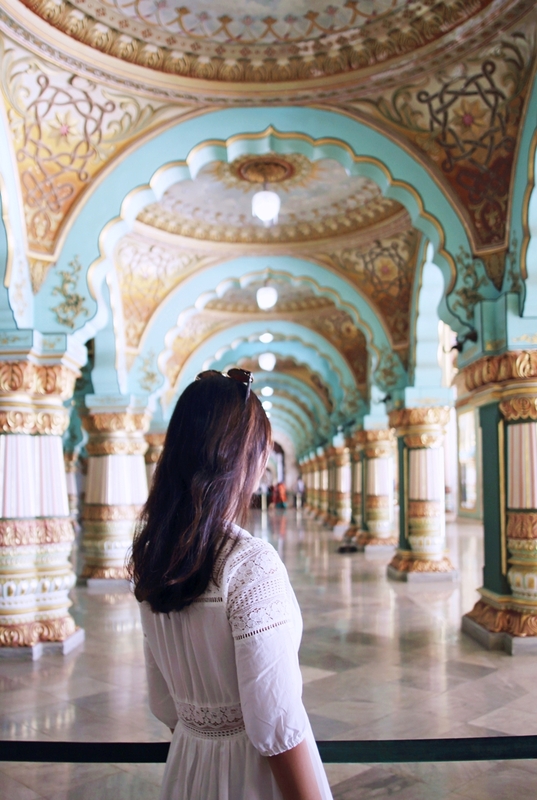 Although India is perhaps most well known for the Golden Triangle, a route encompassing Delhi, Agra and Jaipur in the north, few venture beyond the beaten path and head down south to the lesser-known state of Karnataka. 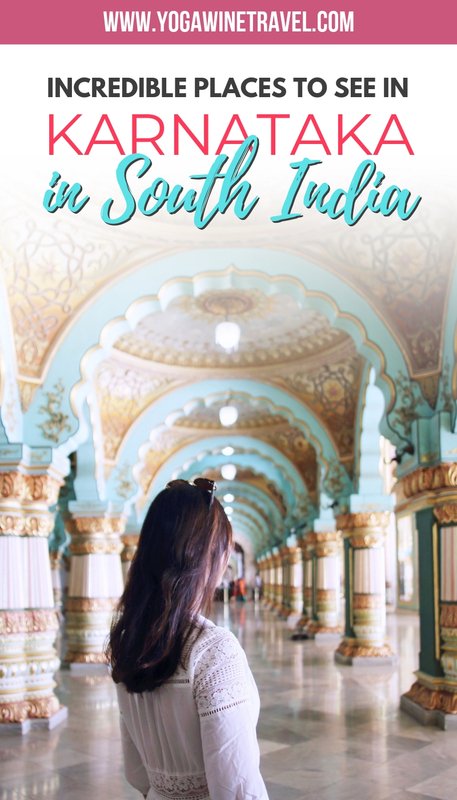 South India tourism is growing every year, but don’t worry if you’ve never heard of some of these places before – you’re not alone! With a state slogan like “One State, Many Worlds,” it should give you an idea of what to expect in this hidden Indian gem. 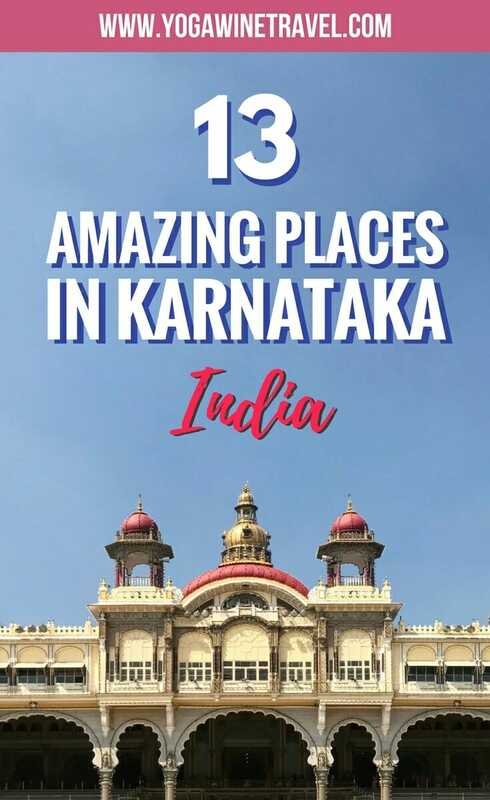 You can easily spend weeks exploring what Karnataka has to offer, so if you are planning your South India itinerary here are some of the best places to visit in Karnataka! Karnataka is in the southwest of India and shares borders with Goa, Kerala, Tamil Nadu and Maharashtra. Though it is only the 7th largest state in India in terms of size, it was the site of prominent Indian dynasties and home of hundreds of heritage sites, national parks, waterfalls, palaces and forts. One of the easiest ways to get to Karnataka is via the international airport in Bangalore. 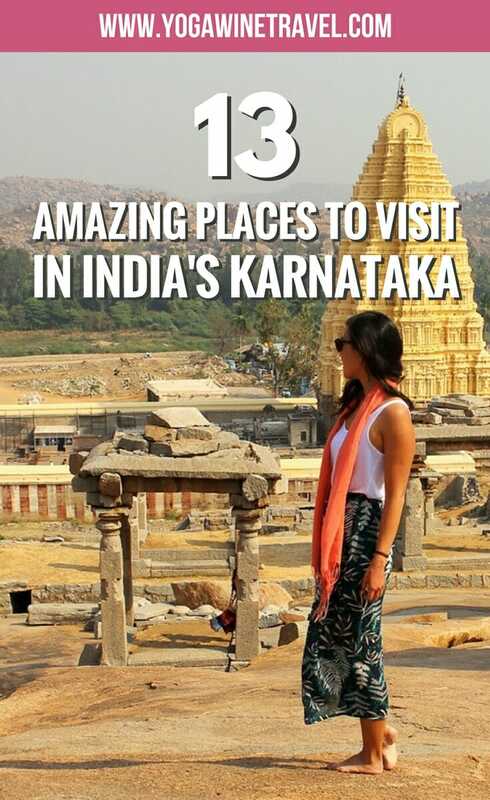 Read on for some incredible places to visit in Karnataka! If you are short on time and want to cover a lot of ground, but don’t want to sacrifice comfort and luxury then look into hopping aboard the Golden Chariot train which departs from Bangalore. In just 7 days you can cover 1 of 2 routes: Bengaluru – Mysore – Srirangapatna – Kabini – Hassan – Belur – Halebid – Shravanabelagola – Hospet – Hampi – Gadag – Badami Pattadakal – Goa – Bengaluru or Bengaluru – Chennai – Mahabalipuram – Pondicherry – Tanjavur – Trichy – Madurai – Trivandrum – Aleppey – Kochi – Bengaluru. 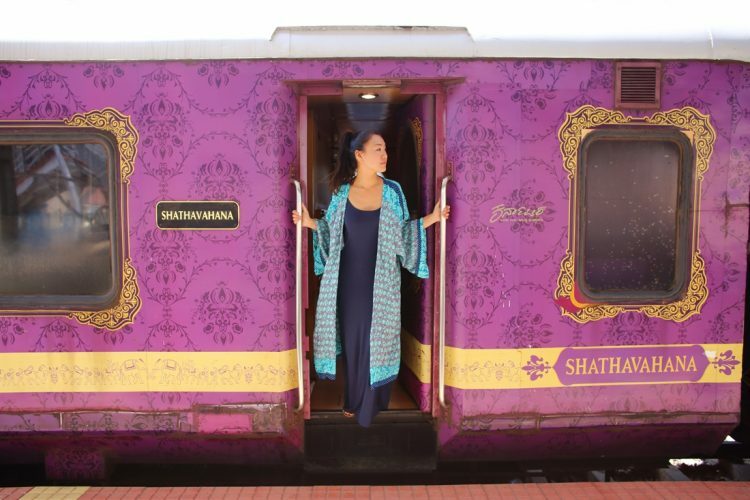 To learn more about the Golden Chariot, click here for 12 things you should know before traveling aboard a luxury train in India. 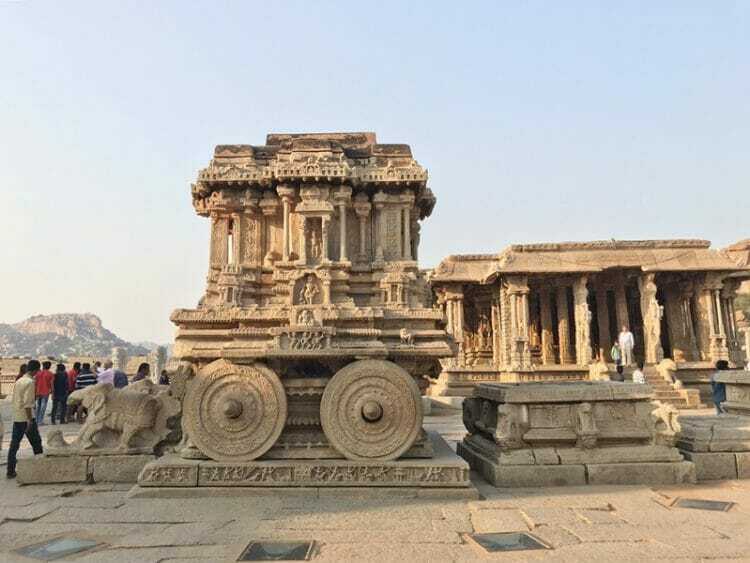 Alternatively, the Karnataka State Tourism Development Corporation also offers various bus tour packages (including female-only ones) to visit places like Hampi, Mysore, Bangalore and Belur. Click here to check out the bus tour package options. On a budget? The state is fairly well-connected by railway so you can also hop on local trains to get from place to place. Headed to the Golden Triangle? 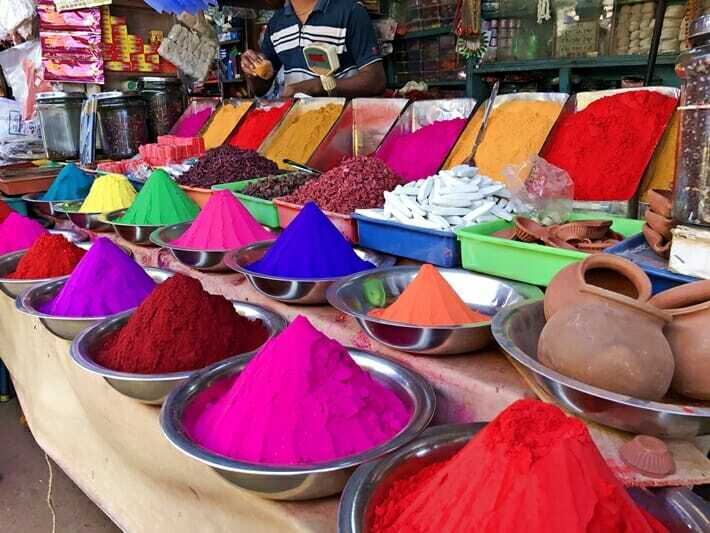 Click here for a complete guide to visiting Delhi, Agra and Jaipur for first time visitors to India! Bangalore (AKA Bengalaru) is the gateway to Karnataka state and has a major international airport with flights arriving from all over the world. It also has a reputation for being the “Silicon Valley of India”, with companies like Infosys and Google setting up shop in the city. 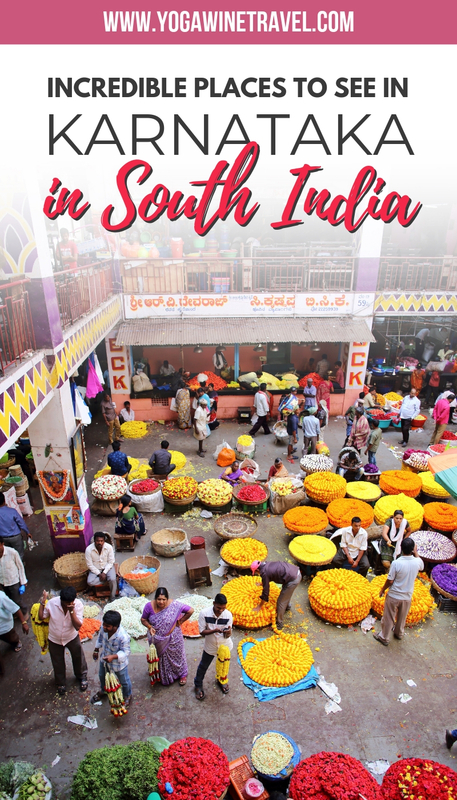 Spend a couple of days exploring what Bangalore has to offer such as Tipu Sultan’s Summer Palace (made entirely of teak), the Bull Temple housing India’s 4th largest bull statue, Lal Bagh botanical garden, and K.R. 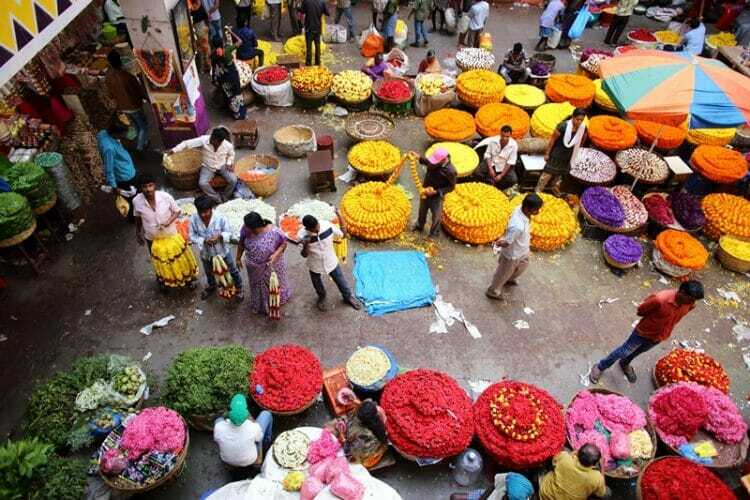 Market for its incredible flower market. 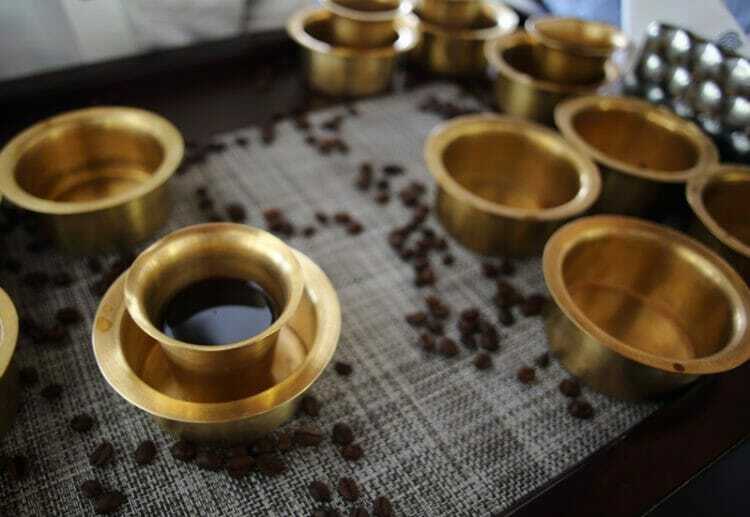 Where to stay in Bangalore: We stayed at WelcomHotel, a new property by ITC Hotels. The rooms are spacious and brand new, and the staff are incredibly friendly. It also has a small rooftop pool that is perfect for cooling off on a hot Indian afternoon! Click here to check current rates at WelcomHotel, or click here for other highly rated hotels in Bangalore! 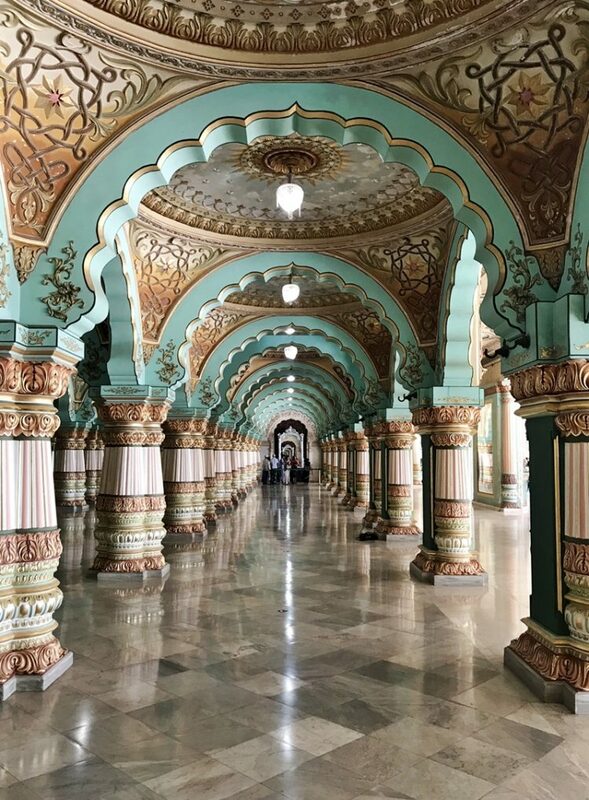 Mysore (AKA Mysuru) is a hub for Yoga lovers around the world (click here for my guide to planning a Yoga trip to Mysore), but also offers incredible sights if you’re not in town to practice Yoga. The former state capital has the beautiful Mysore Palace, hustling and bustling Devaraja Market, palace-turned-hotel Lalitha Mahal, St. Philomena’s Cathedral, and Chamundi Hills. 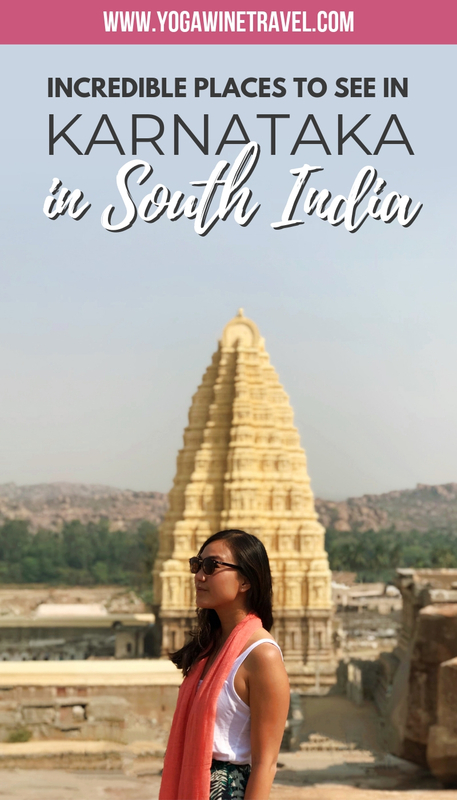 Where to stay in Mysore: I stayed in Gokulam, a neighborhood that is quiet and just 10 minutes away from the Mysore Palace by car. If you are looking for a safe and clean house to live in, look into the Green Lotus. 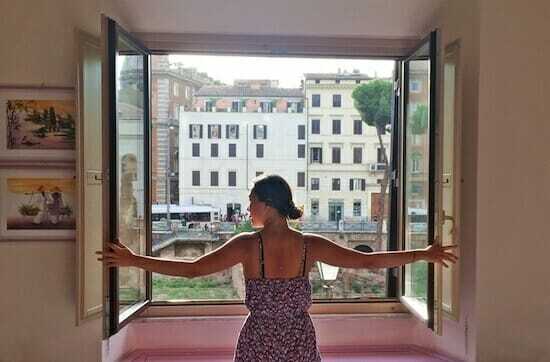 First time using Airbnb? 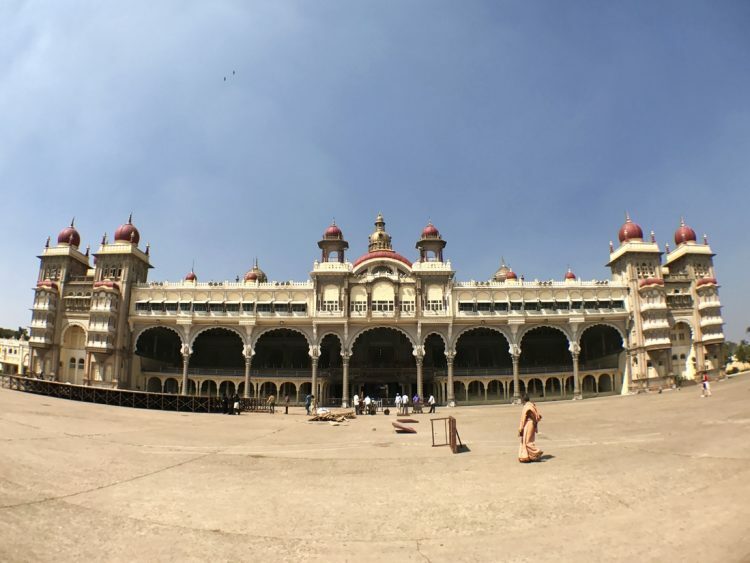 Get $37 in travel credit when you sign up for an account by using this referral link or click here to find other highly rated accommodation options in Mysore. Did you know that Karnataka has the largest population of Tigers in India? If you want to see animals in their natural habitat then head to one of these amazing parks for a chance to spot tigers, leopards, elephants, giant squirrels and much much more. 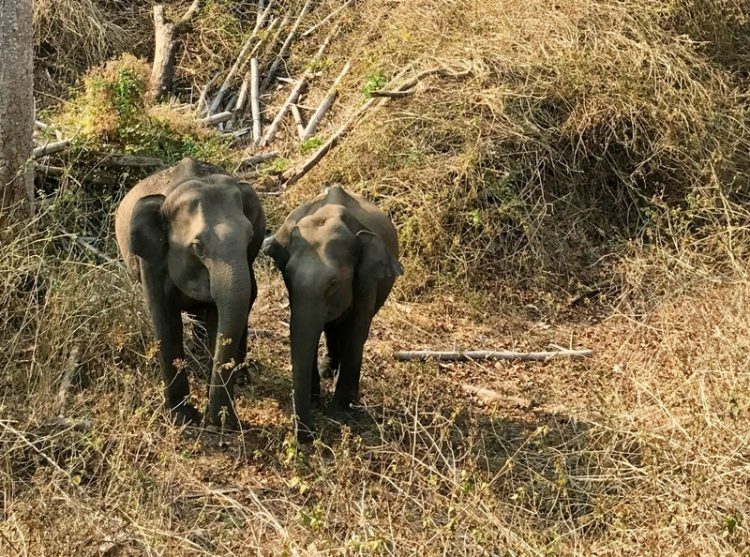 When I visited Nagarhole National Park in 2017 we spotted 2 tigers, 1 leopard crossing the road, plenty of deer and dozens of wild elephants. The parks are approximately 2 hours away by car from Mysore. Where to stay in the national parks: If you are headed to Bandipur or Nagarhole, Kaav Safari Lodge is a stunning eco-luxury property with beautiful rooms and an outdoor pool. The food is some of the best I’ve had in India, and the property only has a handful of rooms (and luxury tents) so you are guaranteed to have a quiet and peaceful stay. Click here to book your stay at Kaav Safari Lodge! 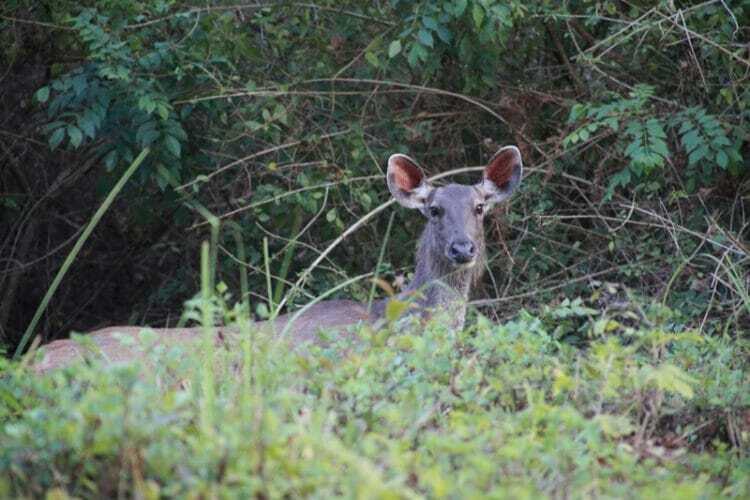 If you are headed to BRT Tiger Reserve, K Gudi Wilderness Camp is located in the B.R.T. 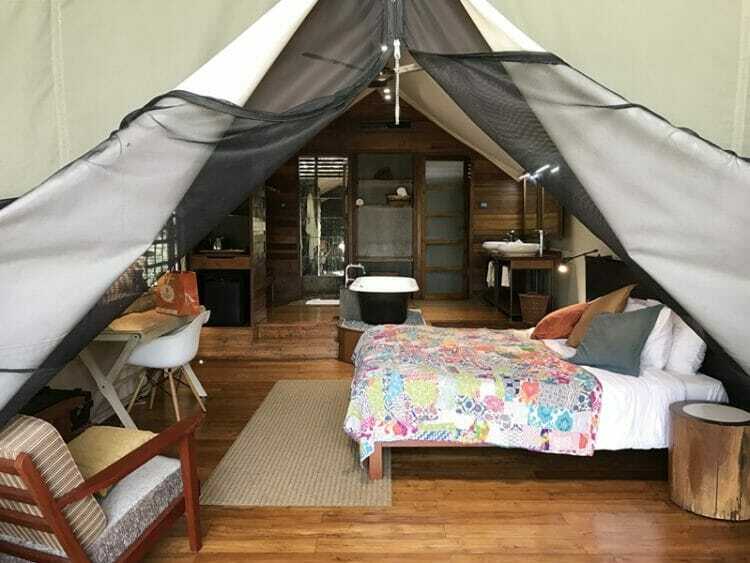 Wildlife Sanctuary and offers tented cottages as well as furnished rooms if you don’t feel like glamping. 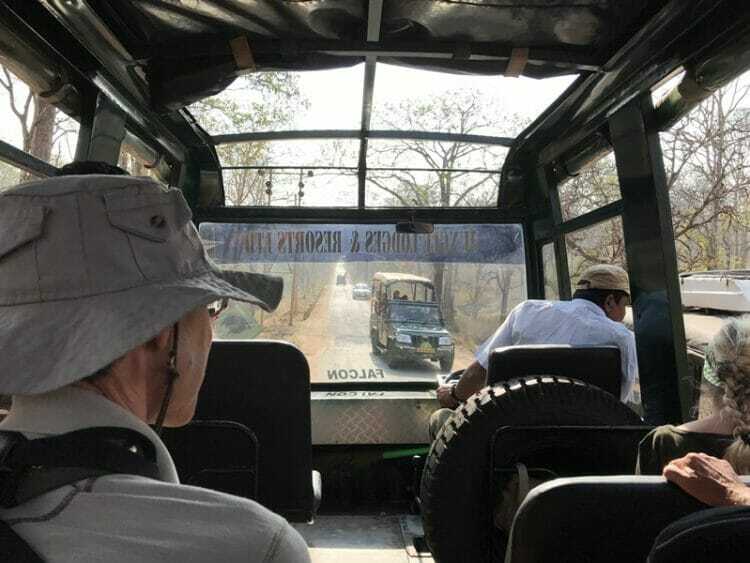 Their rangers take you out twice a day for a morning and afternoon safari for a chance to glimpse at a wild tiger and elephants. Srirangapatna is an easy day trip destination if you are visiting Mysore and is one of the most underrated tourist spots in Karnataka. 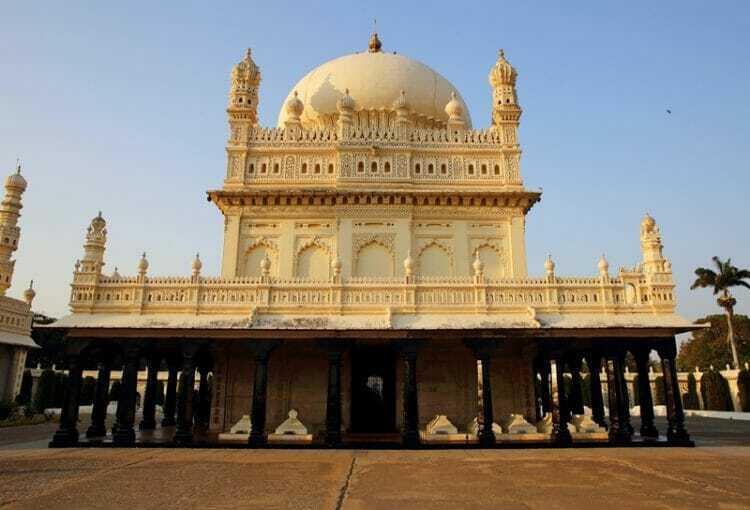 Located just 40 minutes away, travelers visit Srirangapatna to visit the Tipu Sultan’s Dariya Daulat Summer Palace and Mausoleum (AKA Gumbaz). 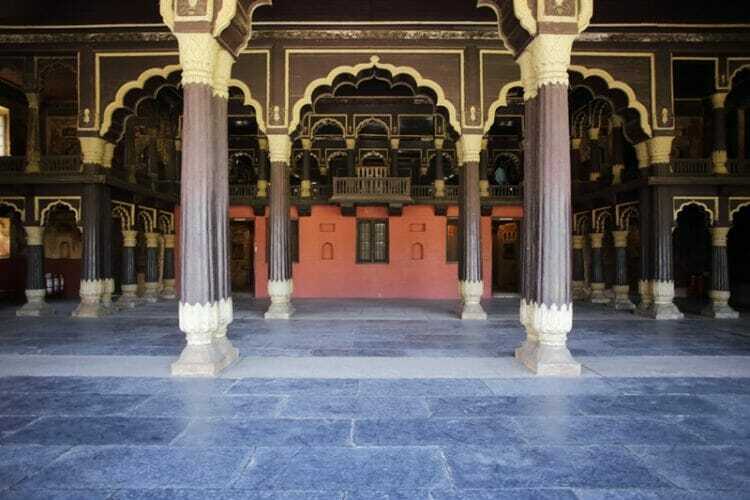 The Summer Palace, like the one in Bangalore, is made of teak wood and has incredibly intricate carvings and beautiful interior facade. The Gumbaz is sometimes referred to as a “Mini Taj” because of its shape, and like the Taj Mahal it also serves its purpose as a Mausoleum for the Tipu Sultan and his parents. 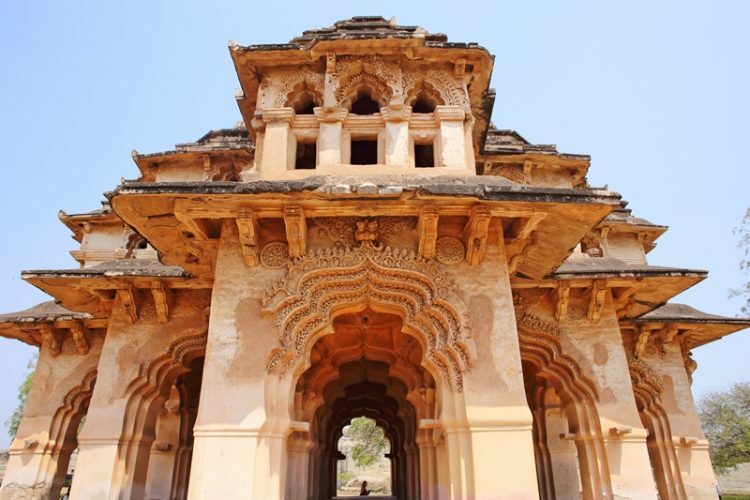 Talakadu is an ancient town buried in sand with beautiful temple remains that you can wander through, one by one. 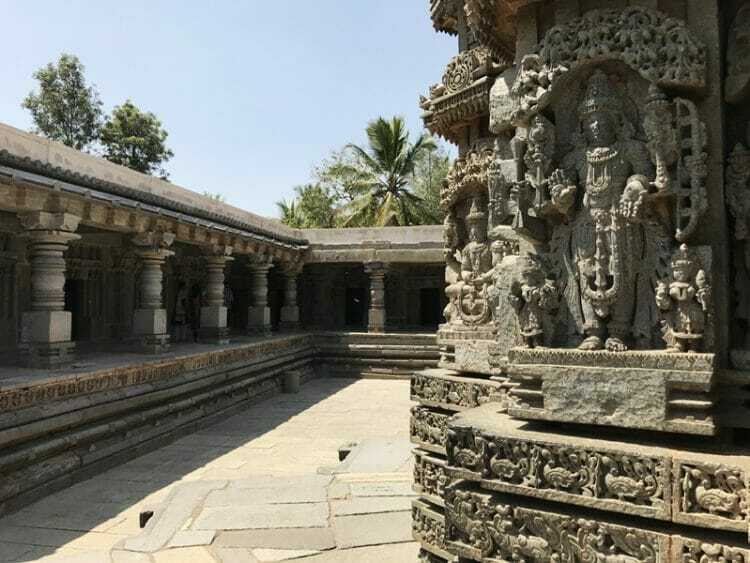 Though it is slightly off the beaten track, Talakadu is one of the most historical places in Karnataka and is a pilgrimage site for Hindus – it is said that there were once approximately 30 temples in its heyday! Talakadu is located an hour away from Mysore and can easily be visited in 1 day along with the next 2 destinations. What’s better than 1 waterfall? 2 waterfalls! The twin falls are a perfect exhibit of South Indian beauty. 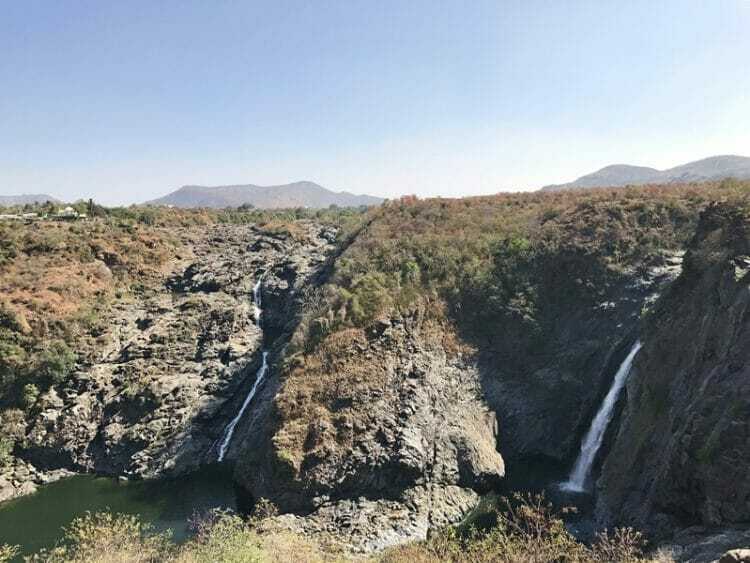 In the monsoon season (summer months) the twin falls (Gaganachukki and Barachukki) roar, but if you visit during the dry season you might still be able to see water trickling down from the Cauvery River. 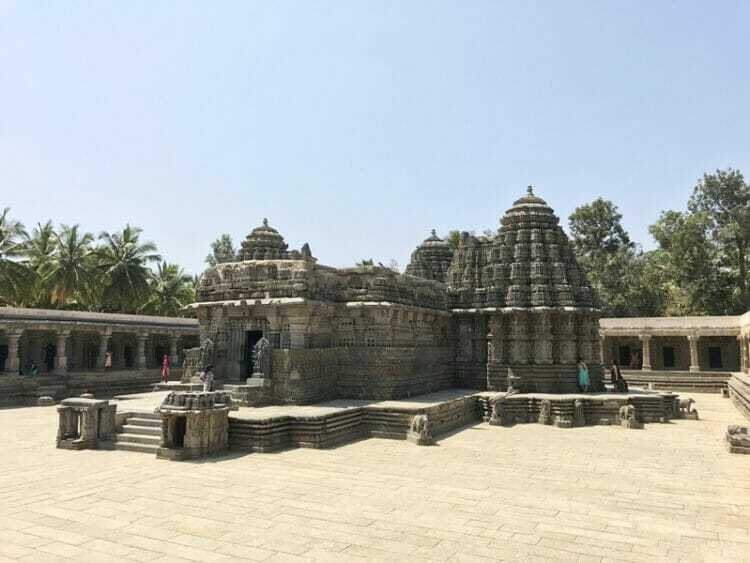 There is no shortage of historical places in Karnataka – Somanathapura is home to the stunning Chennakesava Temple, a Hoysala-dynasty temple dating back to the 13th century. 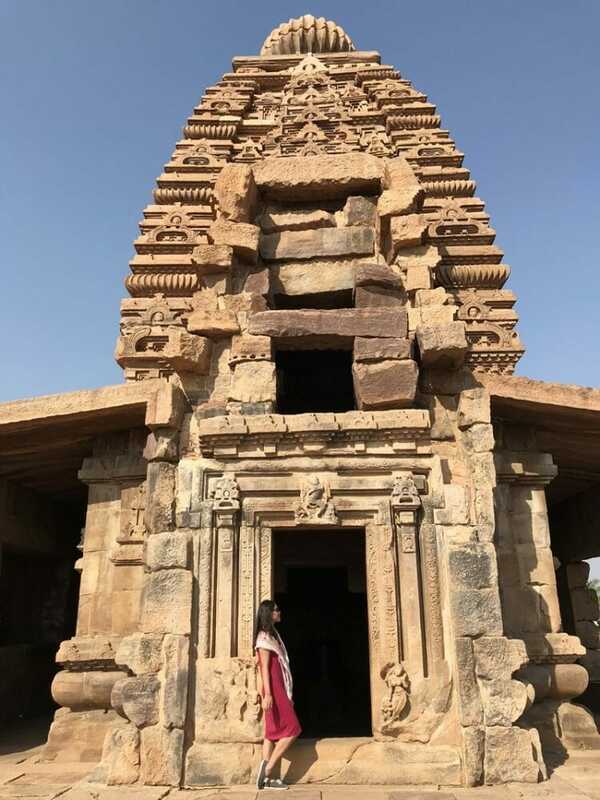 The main temple and outer walls are adorned with beautiful carvings depicting Indian legends and mythology, and don’t forget to look up once you step inside the shrine because the roof design is amazing. 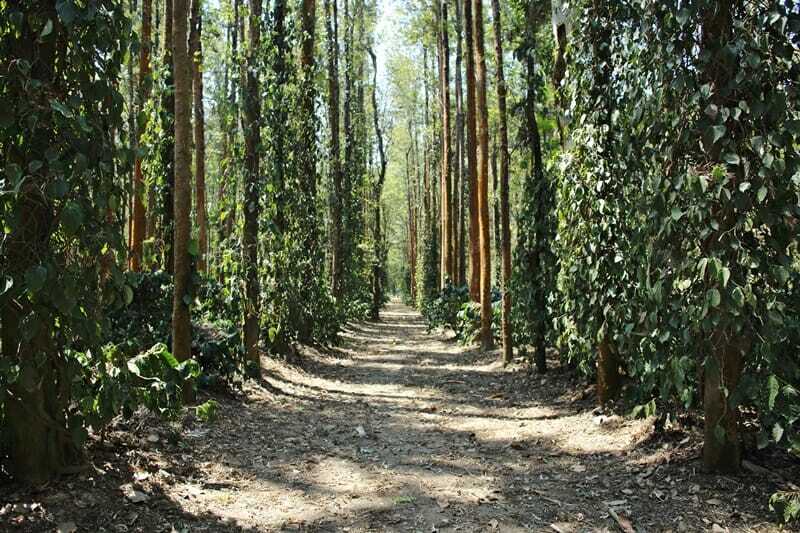 Chikmagalur is famous for its sprawling coffee plantations and hiking trails. 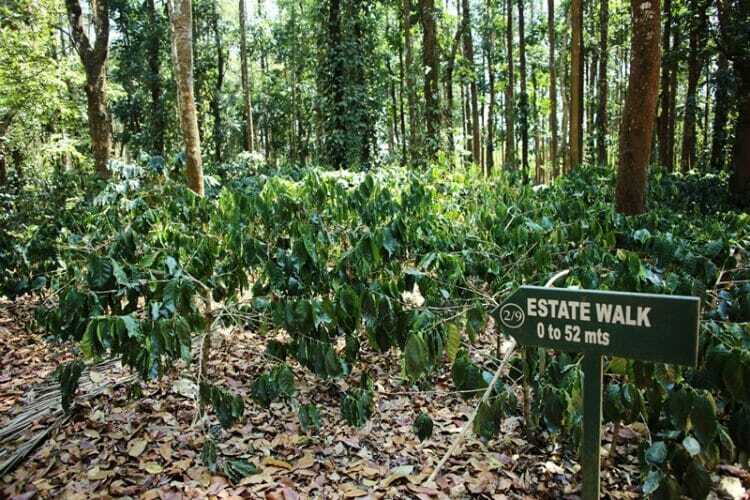 Come here for a day trip or stay overnight at the extremely luxurious Serai – not only does it have its own 70-acre coffee plantation, it offers hour-long plantation tours as you wander through rows and rows of Arabica and Robusta plants. 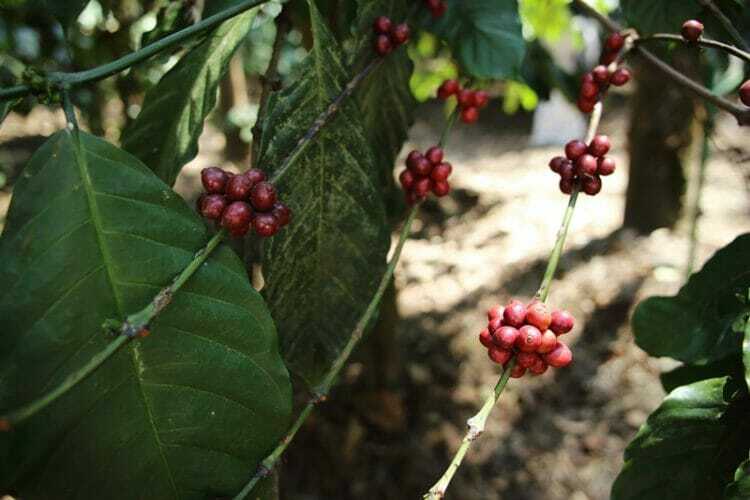 The best time to visit is in June or July with the coffee flowers bloom – when the flowers fall off the node replaces it and planters can estimate how good their crop yield will be. 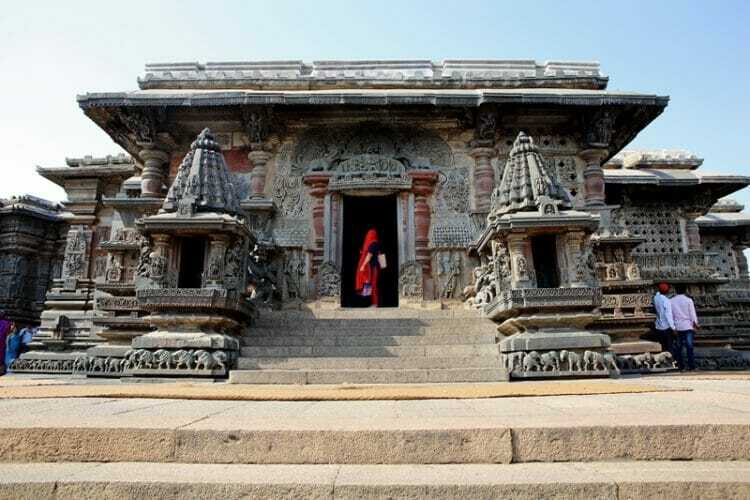 The twin temple towns of Belur and Halebidu in Hassan are world famous for their unique Hoysala style of temple architecture. If you are a culture and history buff then don’t skip these 900-year-old temples dedicated to Lord Shiva. 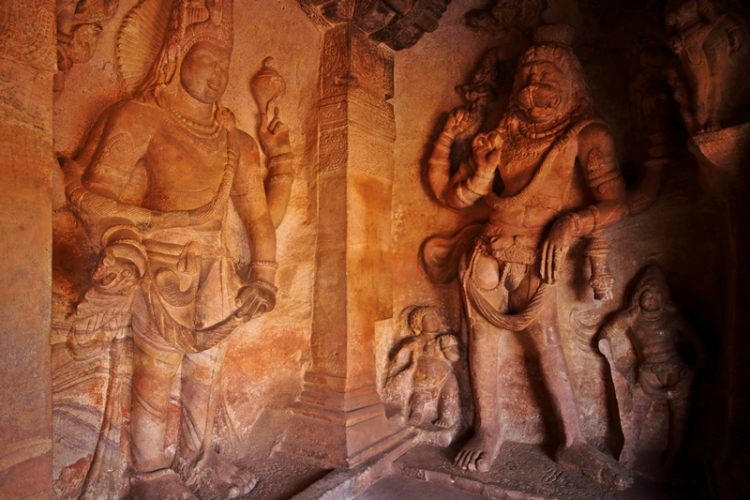 To truly understand all of the myths and legends carved into the walls consider hiring a guide to regale you with stories of all of the Indian gods and goddesses. 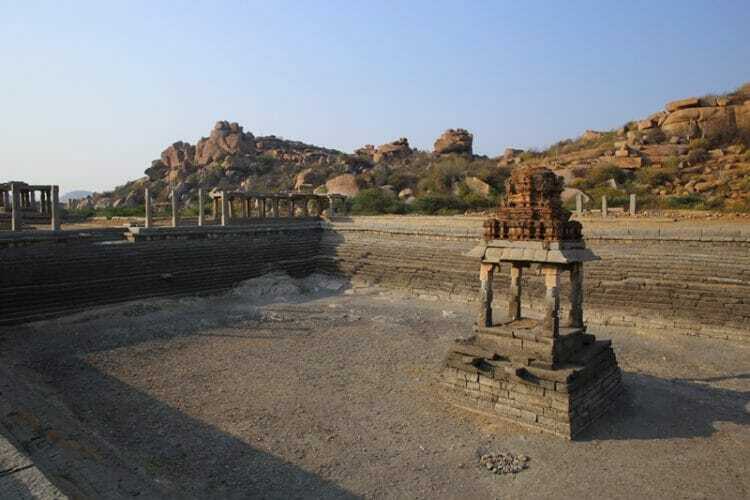 Hampi is widely considered to be the largest open-air museum in the world and was the capital of the flourishing Vijayanagara Empire. It is one of the most popular holiday destinations in South India as it is also a UNESCO World Heritage Site. The ruins are spread over approximately 4100 hectares and features forts, temples, stables, shrines, and more. In fact, the Golden Chariot luxury train is named after the stone Golden Chariot within the Vitthala temple complex! 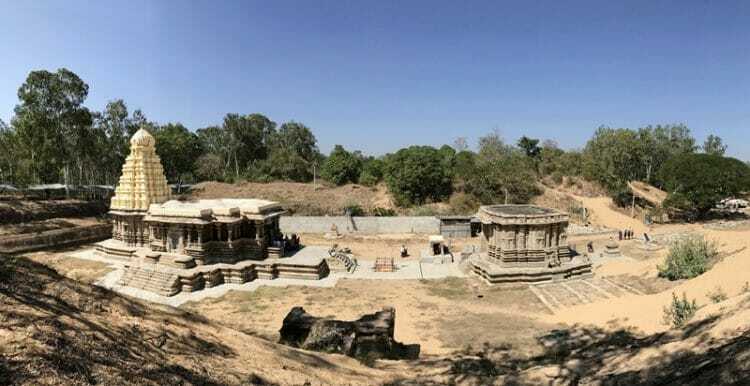 Take a day or two to explore Hema Kuta Hill, Virupaksha Temple, the Queen’s Bath, the Elephant Stables, the Royal Enclosure, the Lotus Mahal, Hazara Rama Temple, Vijaya Vitthala Temple and catch the sunset at Tungabhadra river. 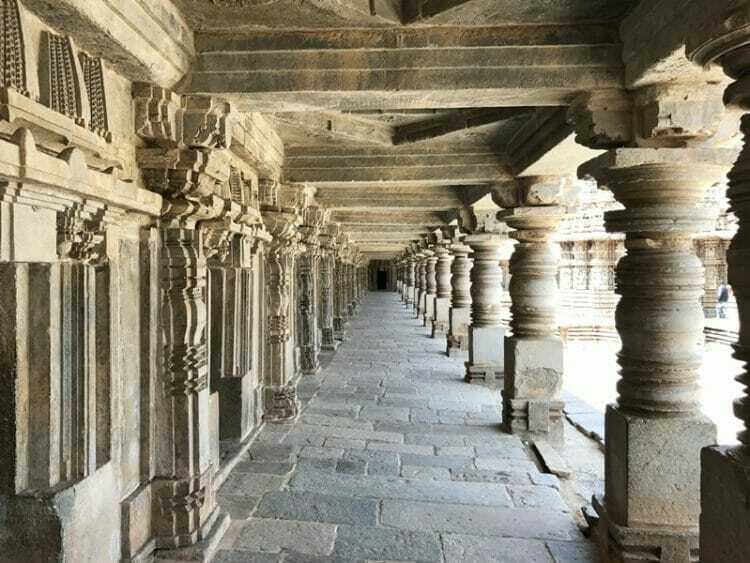 Headed to Hampi? 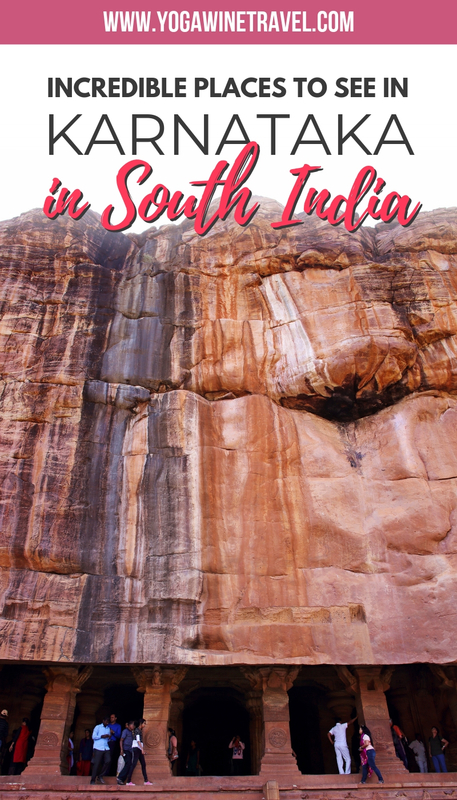 Click here for a complete guide to visiting this UNESCO World Heritage Site! 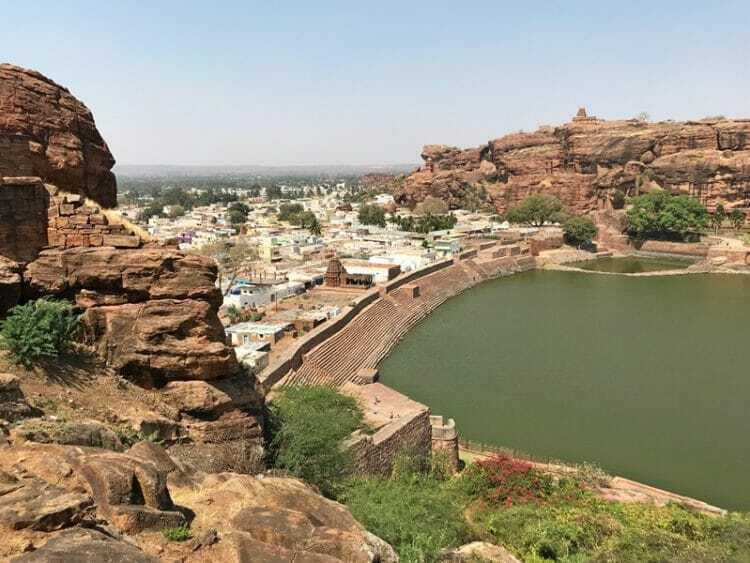 Badami, meaning “almond”, is home to the sandstone Badami Cave Temples, a series of 4 caves carved out of a single monolithic rock. 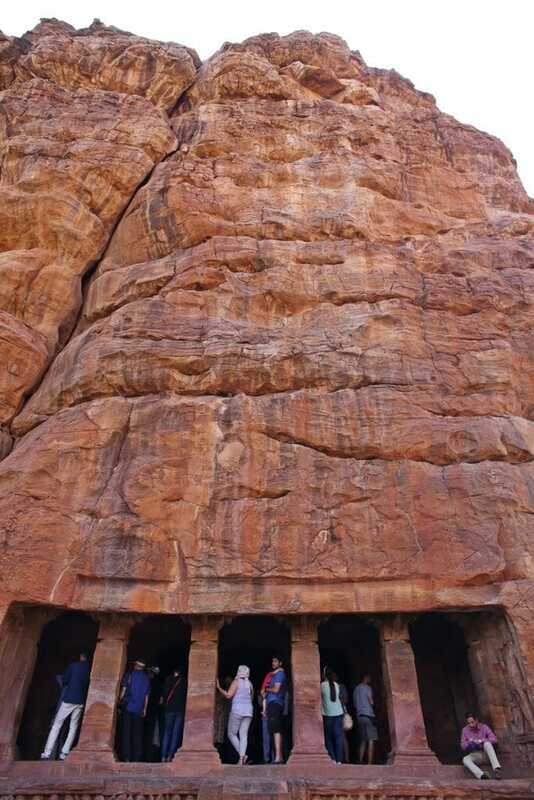 It took the builders 28 years to carve the temples back in the 6th century, and today the caves are frequented by Shiva, Vishnu and Jain devotees. Be careful of the very cheeky monkeys that steal handbags, scarves and food from visitors! 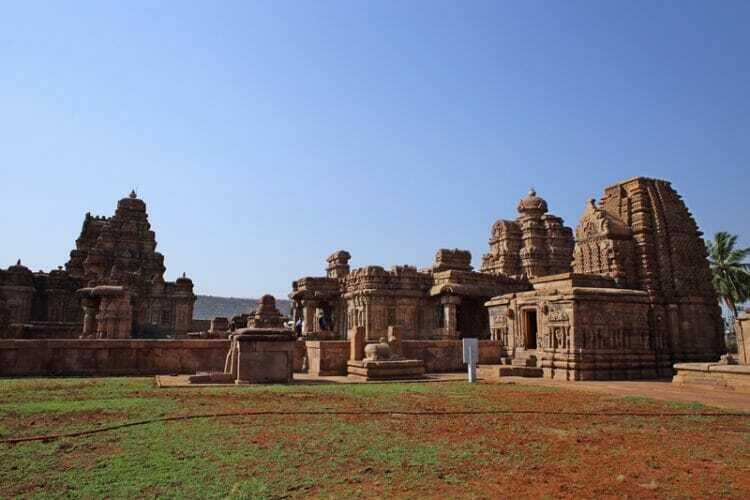 Like Hampi, Pattadakal is a UNESCO World Heritage Site and is known for being the “cradle of Hindu temple architecture”. 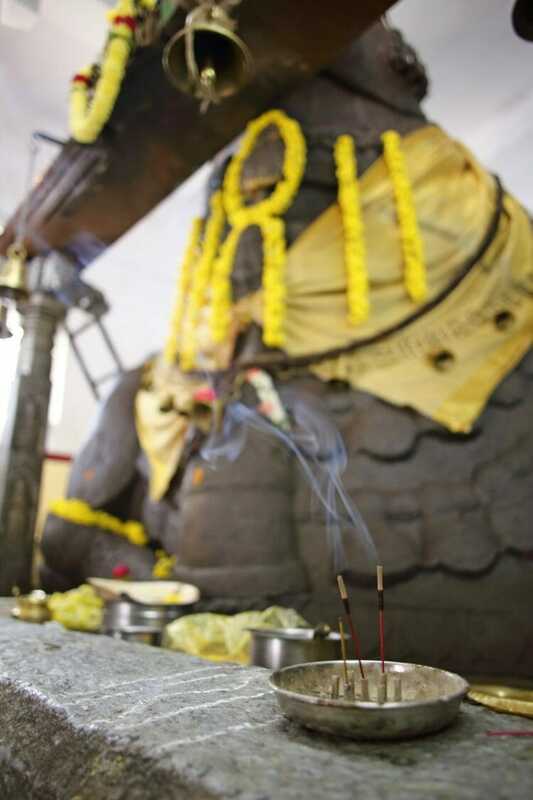 The temples are extremely well preserved and features 8th century temples and shrines dedicated to Lord Shiva. 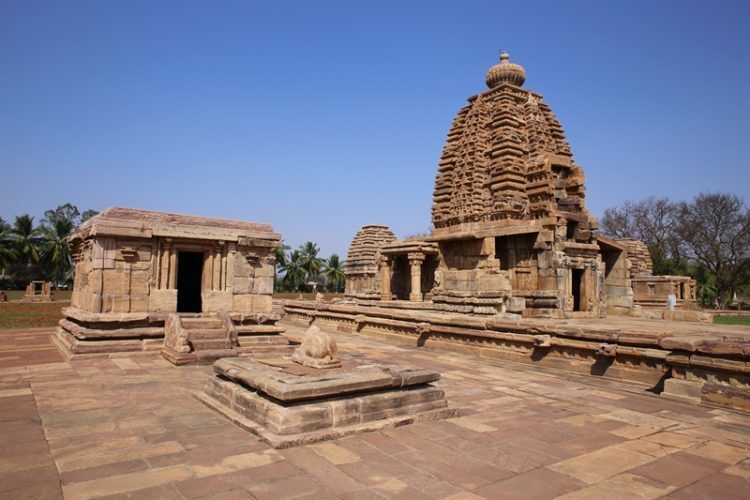 Pattadakal was considered a holy place and cultural center because of the Malaprabha River which flows from south to north – it is believed that all rivers originate from Lord Shiva’s head in the north, so the Malaprabha River was holy because it leads towards Shiva. 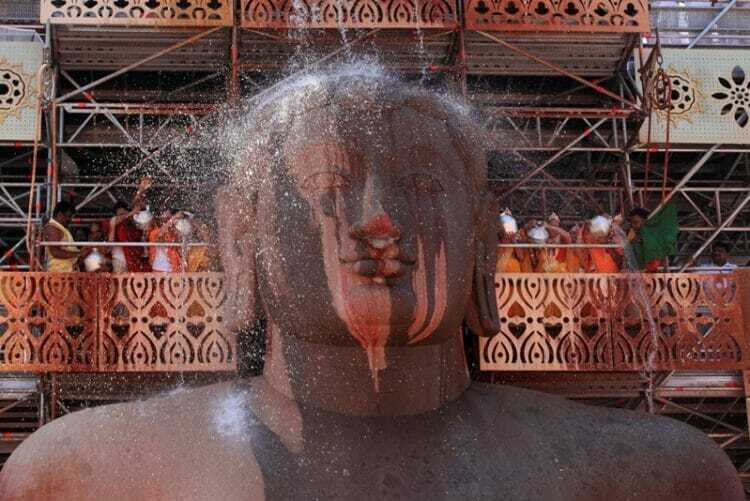 Though we had initially planned to visit Shravanabelagola, unfortunately we had to cancel our trip because it coincided with a religious ceremony that only takes place once every 12 years. It is a major Jain pilgrimage site and home to an astounding 57 feet tall statue of Lord Gomateshwara. Click here for more India travel guides and tips! Have you been to any of these beautiful places in Karnataka? Tell me all about your trip in the comments section below! 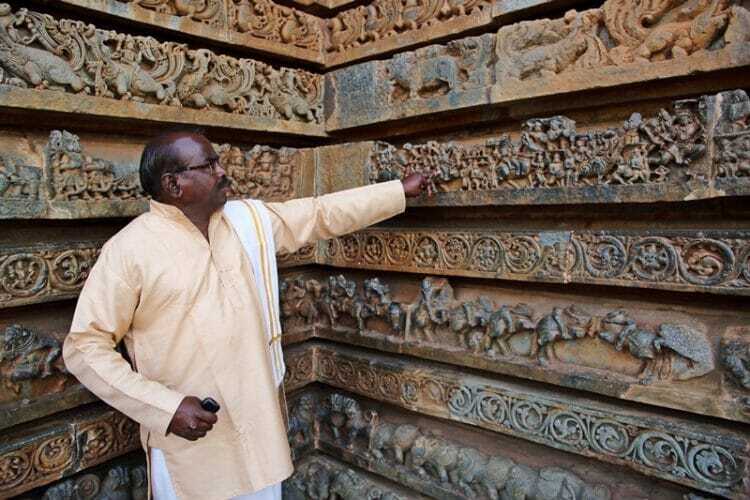 I visited Karnataka twice over the course of 2 years – the first time as an independent traveler in 2017, and again as a guest of the Karnataka State Tourism Development Corporation / India’s Ministry of Tourism in 2018. No compensation was received for this review, and as always, the opinions on Yogawinetravel.com are (and always will be) my own! This post does contain hotel affiliate links. If you choose to book your stay using these links, I will earn a small commission at no extra cost to you. Thank you for supporting my website by using these links, I only recommend products or services that I have had positive personal experiences with and think you would love too. 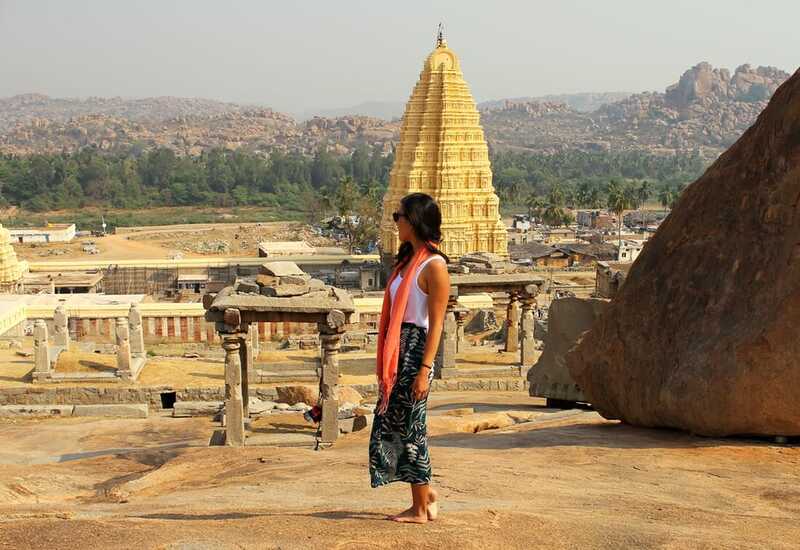 Many thanks to Kerri from Beer and Croissants for taking the feature photo of me at Hampi.